>I like to get into projects that are way over my head. I have been wanting to make my husband a memory quilt for a long time. We each have a giant tote in the basement labeled ‘Keepsake clothes’ Which I find humorous. I had his Mom find me some shirts from when he was a little guy and for the backing I chose his skateboarding pants, shorts, and a thick long underwear shirt he always wore. Then the rush began to get it done before Christmas. Why I didn’t buy him a new video game or a new book or something I have no idea. This took me forEVER. I didn’t intend on blogging this so my pictures aren’t the best. Everything started out smooth sailing but once squares weren’t matching up correctly the seams started pulling and bunching. 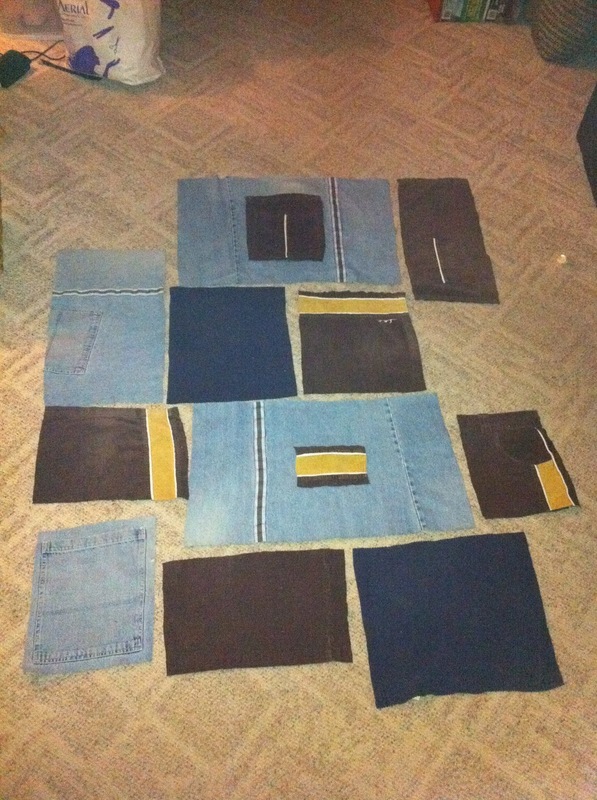 I ended up having to take fabric pieces in some areas and sew them on the top of empty spots. Once I got the front done I learned from my mistakes a little. I made sure I lined up a row at a time and then connected the rows. 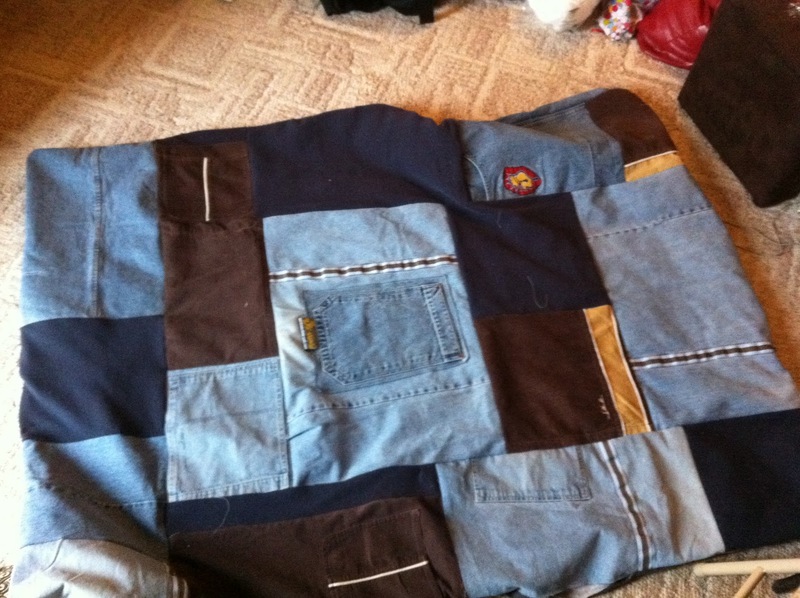 -Cut and baste batting onto the back of the front of the quilt. 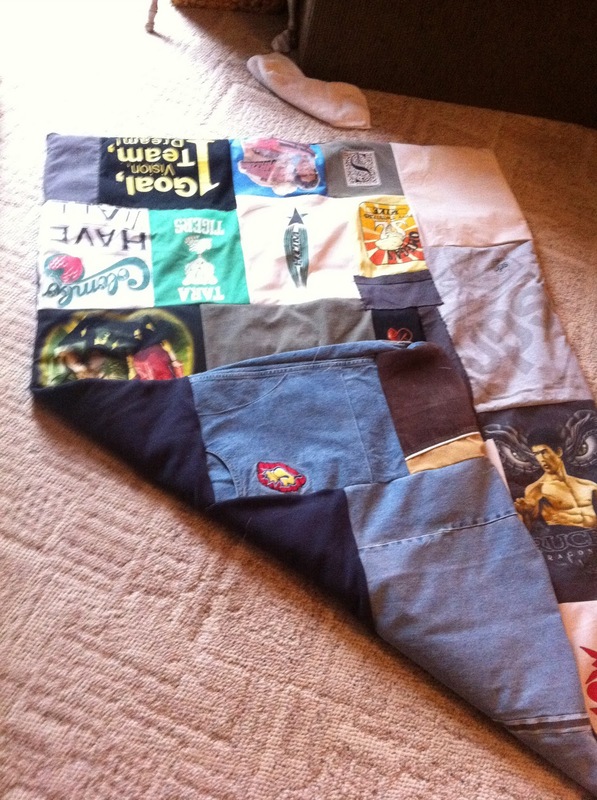 -Put the right sides together of the front and the back of the quilt and sewed around the whole quilt like a pillowcase, leaving an 8 inch opening. -Flip right side out and stitch opening shut. 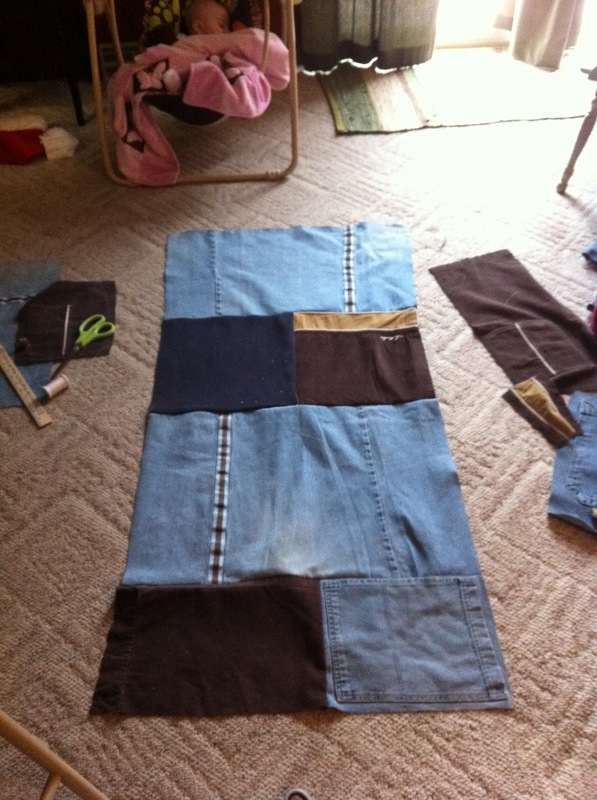 -Using hand quilting needle and thread quilt tie stitches about 4 or 5 inches apart wherever you think looks good. 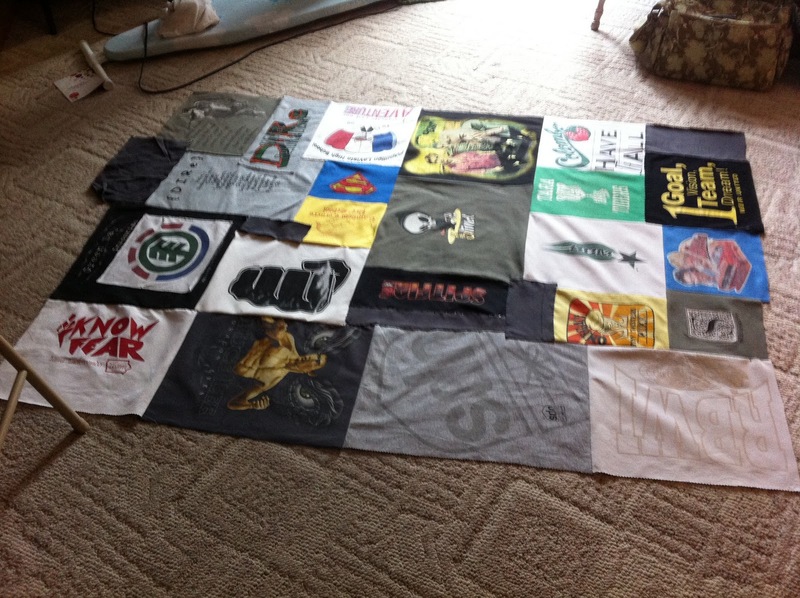 I think next time I will cut fabric squares all identical in size and then overlay t-shirt logos onto the squares. That way everything will line up from the beginning. 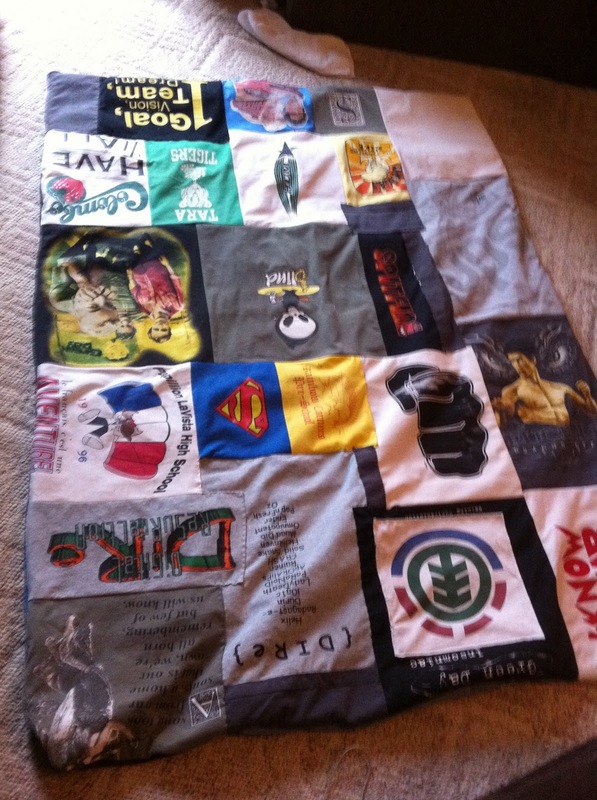 My hubby loved it, wrinkled and all. Maybe we can move the keepsake clothes to a smaller bin. yaay.